← Cooking with Poo Tour! Last night Elliot asked me if there were any jobs he could do around the house. Yes it sounded strange to me too! He wanted cash… but for a good cause. He is following the 40 Acts kids material for Lent and has made a ‘generosity pot’ to save up spare change and give away at Easter. It’s just tricky to have spare change when you’re six! So I was delighted to see him tidy up the lego in the lounge, empty the bin and sort out a white wash to put in the machine… all for the reasonable sum of 70p (after a bit of bartering!) and at the expense of watching Scooby-Doo. Actually I was so pleased that I may have mentioned it casually in the playground this morning! I wondered why the other mums looked dubious. Later my sister-in-law asked if I had checked through the washing in the machine for red socks before putting it on. I hadn’t. 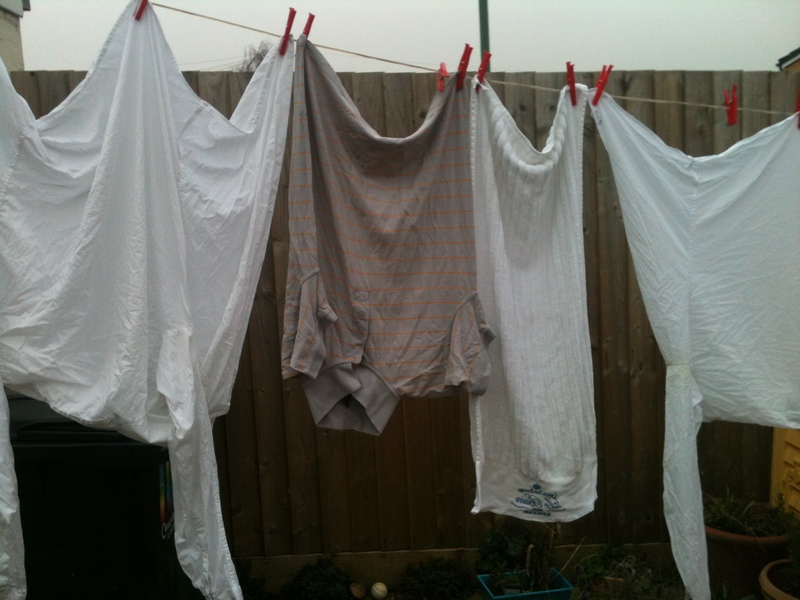 I’ve just hung it out on the line and it seems Elliot’s definition of ‘white’ is a little looser than mine! A little mistake like that doesn’t matter, I’m still thrilled with Elliot’s effort and will encourage him to keep it up. I like my clothes slightly grey anyway, who doesn’t?! But it has made me think how much easier it is to do a job yourself if you want it done well. As a perfectionist I’m particularly guilty of this attitude but I’m finding it can be a really harmful one. I guess including others in any project means being willing to accept mistakes and arrive at a different outcome than you have in mind. I need to remind myself that the journey of working alongside someone else is valuable in itself; just as valuable as the end goal. And the trust implied in handing over a task or allowing someone else to run with an idea speaks volumes. It blows my mind that Jesus allows me to be part of his work in the world even when I’m painfully aware of my own weakness. I’m thankful today for all the people who have let me make mistakes. I want to find ways of encouraging others to use and develop their gifts, even if it means holding back with the ‘helpful’ advice. Tonight I have to facilitate the construction of a very ambitious weather mobile. Pray that I will let my son make as many mistakes as he needs but still have something to take into school in the morning! Our family is about to become hugely dependant on the support of others. Those choosing to pray and donate money towards our move are allowing us to step out and serve God in a new setting. You have believed in us and that feels great! Future neighbours and teammates will no doubt have a lot of mistakes to put up with as we are freed up to be learners! Dependance is an uncomfortable position to be in at times but if it keeps me from that ‘do it myself’ attitude then bring it on!